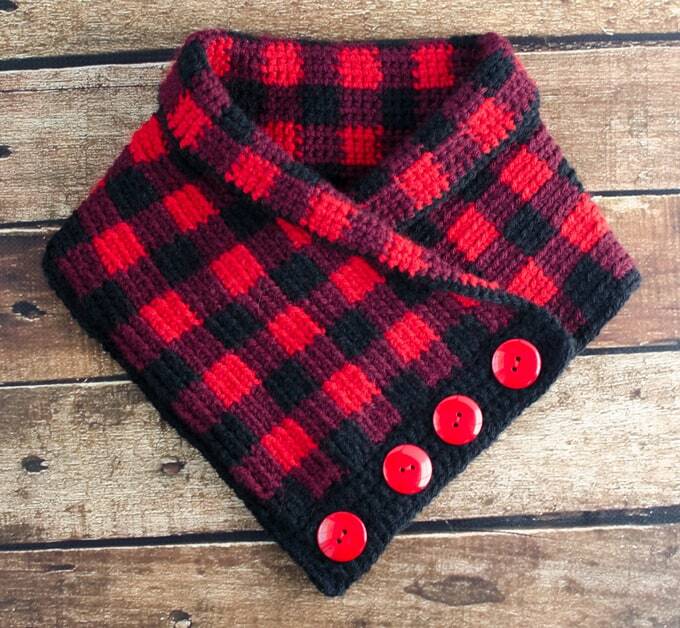 Introducing the Buffalo Plaid Cowl! I am so in love with this cowl. I can’t wait to wear it. It’s just a classic look that is fun and modern. Perfect for work but also great with jeans on date night. Are you having as much fun as I am with these Buffalo Plaid Projects? First up was the classy Buffalo Plaid Cup Cozy. Next came the stylish Buffalo Plaid Wristlet and now…THIS. 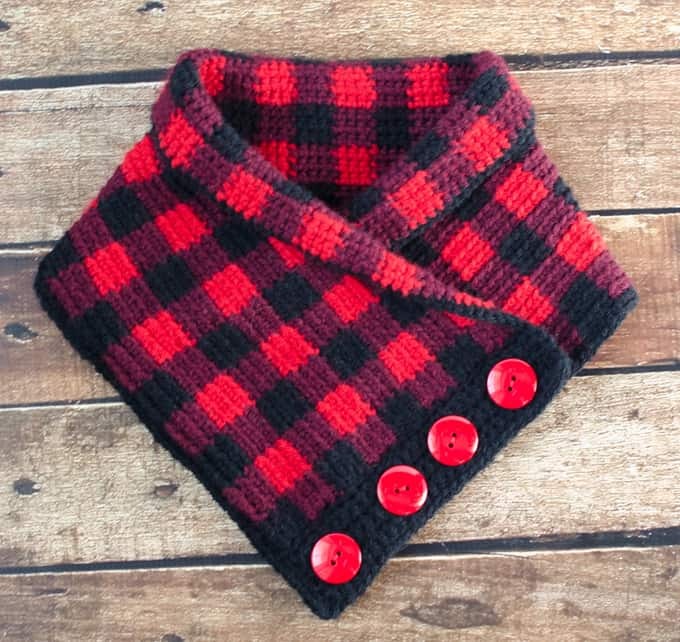 The Buffalo Plaid Cowl! Aren’t those big, bright red buttons delicious? I love them. I “auditioned” many buttons for this cowl, but in the end, the classic red button was just the thing. Like our other two buffalo plaid projects, we are using Lion Brand Vanna’s Choice in Scarlett, Burgundy and Black. I love this color combination! If you are going with another brand, be sure to check the 2 reds together under different lighting conditions to make sure they work well together. As in the previous 2 projects, two colors are used in each row. The non working yarn is carried along and crocheted right over with the working yarn. Check out this post on how to tapestry crochet for everything you need to know on this technique. This project is worked on the right side of the work (no turning). Every row starts with a standing single crochet and the yarn is fastened off at the end of every row. For the Buffalo Plaid portion of the pattern, work into the back loop only. Let’s get started! Lion Brand Vanna’s Choice: Scarlett, Black and Burgundy, 2-1/2 oz each. Be sure to read how to tapestry crochet so you understand how to change colors with this technique. Every row starts with a standing single crochet stitch. Carry the non-working yarn. Work into the back loop only. R1: With black (and working over unworked burgundy yarn), sc in next 4 st, changing to burgundy in the last stitch, using burgundy, sc in next 4 st, changing to black in the last stitch. Continue to work sc across row, alternating 4 stitches in burgundy and 4 stitches in black. At the end of the row, fasten off and leave an end to weave in later. R2-3: Repeat pattern, working sc across row, alternating 4 stitches in black and 4 stitches in burgundy. At the end of every row, fasten off and leave an end to weave in later. R4-6: Pattern colors switch here to burgundy and red. Starting the row with a burgundy sc in the next 4 st, changing to red in the last stitch, using red, sc in the next 4 st, changing to burgundy in the last st. Continue to work sc across row, alternating 4 stitches in red and 4 stitches in burgundy. At the end of the row, fasten off and leave an end to weave in later. Rows 1-6 establishes the Buffalo Plaid pattern. R7-24: Repeat rows 1-6 (3) more times. Weave in ends. I know, there are a lot, but the finished piece is worth this bit of work. When that is done, lay out the cowl so that the right side is up. As you look at the cowl, the right side edge will be the buttonhole band side and the left side edge will be the side that is underneath, that holds the buttons. Note that for the remainder of the pattern, you will be working in both loops of your stitches. R4 (buttonhole row): sc in next 2 st, *ch3, skip next 3 st, sc in next 4*, repeat * to * 2 more times, ch 3, skip next 3 st, sc in last 2 st. ch 1 and turn. R6: sc across (28 st). Fasten off. R2-6: sc across, ch 1 and turn (28 sc). Before fastening off, test out the length of the cowl by trying it on. The buttonhole band crosses over the button band at a 90 degree angle, so that the buttonhole band edge lines up with the bottom row of the cowl on the button band side (see photo). Try this on, pinning the edge down as if the buttons were sewn on. If the cowl feels too tight and you would like it bigger, crochet some extra rows of single crochet on the button band. The button band is completely hidden from view and no one will ever know! Fasten off. Work a row of single crochet around the buffalo plaid cowl, working on the right side. Work 3 sc into each corner. When you come to the front lower, left side (the front side without the buttonholes), work through a double thickness of the cowl. This helps hold the cowl in place in addition to the buttons. Fasten off yarn. Weave in ends. Sew on buttons. Ta Da! Your fantastic buffalo plaid cowl is done! 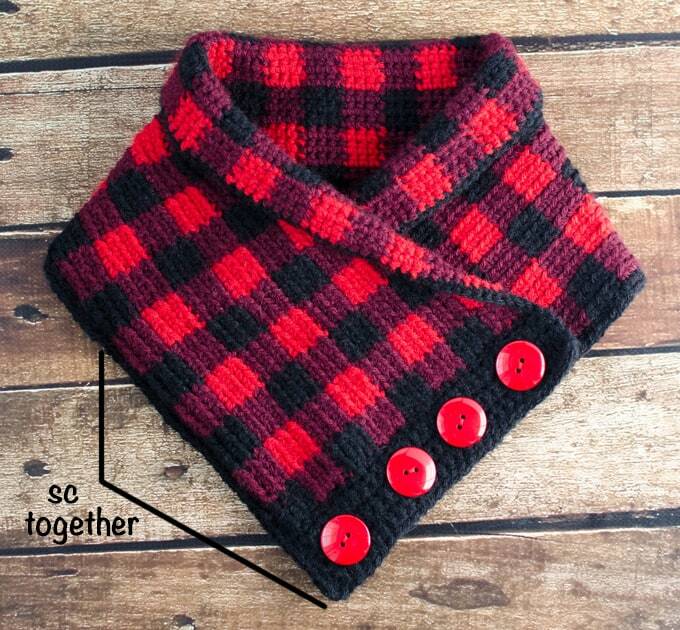 Looking for more Buffalo Plaid Projects? 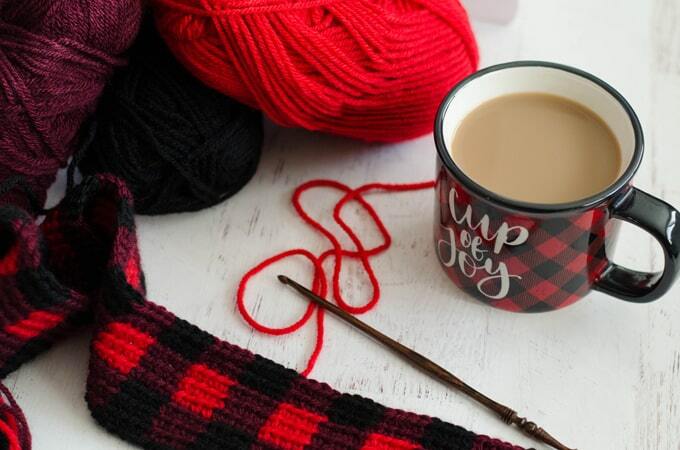 Then be sure to check out the Buffalo Plaid Wristlet and the Buffalo Plaid Cup Cozy. I love seeing your finished projects! If you enjoyed making the Buffalo Plaid Cowl, I’d love to see yours on Instagram, be sure to tag me @crochet365knittoo. If you are on Facebook, stop over to the Crochet 365 Knit Too Facebook page or pop over to the Crochet365KnitToo Club and share a photo! I’d love to see your work! Written pattern copyright Cheryl Bennett 2018, all rights reserved. Please do not reprint or repost this pattern. 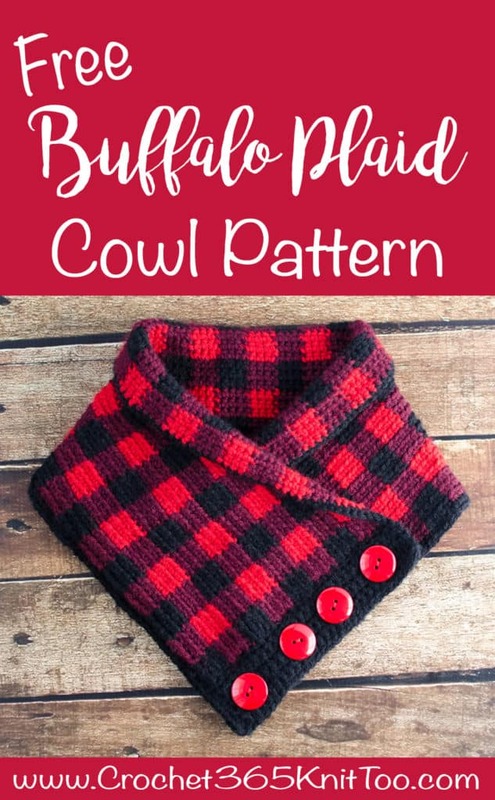 If you would like to share this Buffalo Plaid Cowl pattern with others, just link to this page. If you’d like to make items for sale from this pattern, please visit my About page for more information. Thank you to Lion Brand for providing the yarn for this pattern. Hi Debbie, Thanks for your note. There should be 124 stitches in each row. And there should be no turning, as you pointed out. I changed the pattern to reflect those corrections. I read the patterns over and over before posting and still sometimes little typos get by me. Sorry about that!